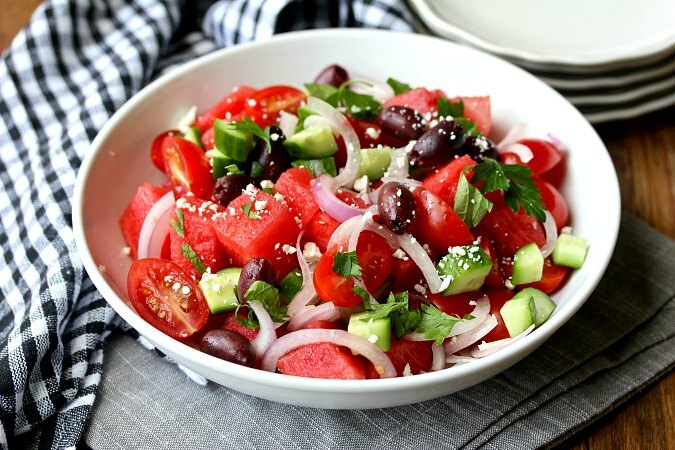 This Greek-Style Watermelon and Tomato Salad with cucumbers, red onions, kalamata olives, and feta cheese is the perfect salad for a summer evening. This Greek-style watermelon and tomato salad is such refreshing summer dish. The sweetness of the watermelon and the saltiness of the kalamata olives are unexpectedly delicious together. This salad is also flavored with fresh parsley and mint, and drizzled with olive oil and good red wine vinegar. I used Persian cucumbers in this salad because they are mild and slightly sweet, and very thin skinned, but you can use any kind of cucumber you prefer. This week the Kitchen Matrix Cooking Project is celebrating watermelon. Camilla, Wendy, and I are choosing from Watermelon +12 Ways from Mark Bittman's Kitchen Matrix. Our choices include cocktails (the gin and basil one is calling my name, as well as the hard lemonade with pureed watermelon ice cubes), salads, soups, and desserts. After the recipe, be sure to check out the links from A Day in the Life on the Farm and Culinary Adventures with Camilla. They are always so creative and innovative with these ingredients. Summer, with its heat and humidity, is the perfect time for juicy watermelon. My grandsons absolutely love it. When my oldest grandson was little, I'd buy him a small watermelon and let him go to town on it with a melon baller. He would have so much fun. How do you know if a watermelon is ripe and delicious? Pick it up. If it feels heavy for its size, it's probably juicy and good. Also, give it a thump. It should sound hollow. Random question: Did you know you can stir-fry watermelon rind? You can! If you hate wasting food, check out this post from Grace Young, the author of Stir Frying to the Sky's Edge. I loved, loved, loved this salad. Tomatoes and watermelon belong together, and melon lends itself to savory flavor combinations (I love salt on melon). I used only a small amount of the dressing on this Greek-style watermelon salad as it was totally delicious on its own. You can make the salad in advance and add the dressing just before serving. You might have trouble "selling" it to those picky people who aren't willing to try this unorthodox combination, but that just means there is more for you. If you have any leftover watermelon, be sure to make this watermelon lemonade sorbet. 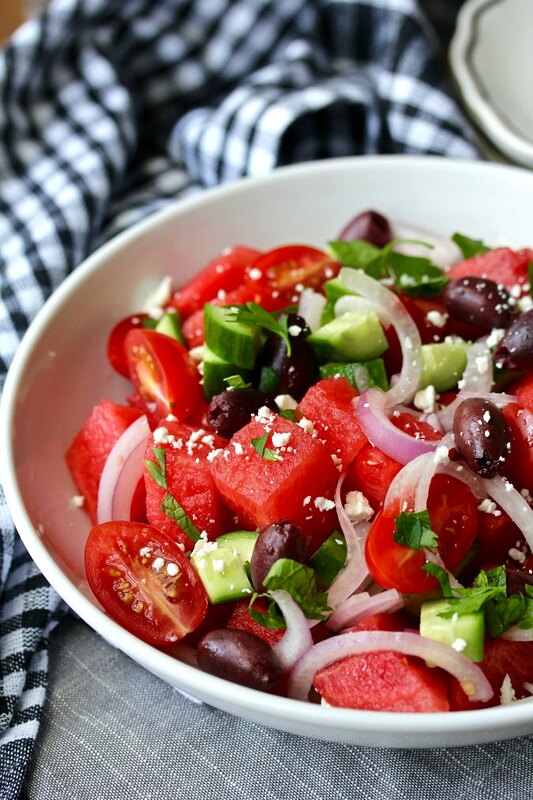 Greek-Style Watermelon and Tomato Salad with cucumbers, red onions, kalamata olives, and feta cheese. Extra virgin olive oil and red wine vinegar to taste. I went very light with the dressing. 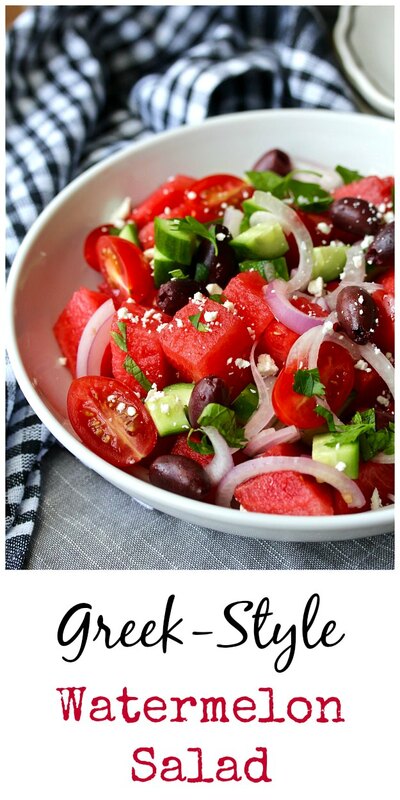 Add the watermelon, tomatoes, cucumber, red onion, olives, feta, and herbs to a salad bowl. Sprinkle with a pinch or two of salt, drizzle with olive oil and red wine vinegar, toss, and serve. Here's what Camilla and Wendy made! must make this... I've been totally boring as far as salad goes.. Caprese, Caprese, Caprese. That looks so fresh and flavorful! We just got another watermelon in our CSA box, so this could happen soon! Oh definitely. It's way more delicious than expected!